I mapped the subscribers to the MLSN newsletter. As of this week, there are 393 subscribers from 33 countries. Golf architect Paul Jansen is in the midst of what he calls the "Sustainable by Design" tour. He is making an intensive tour around South and Southeast Asia, visiting and studying some of the most interesting places and golf courses. And he is documenting this as he goes along, with photos, writing, and videos. What kind of places is he visiting? Do you recall Nuwara Eliya? C.V. Piper wrote about the club in Turf for Golf Courses. When Piper visited, the course was already 22 years old! And that was 116 years ago. How good is the turf at Nuwara Eliya today? Pretty impressive. The fairways are primarily narrowleaf carpetgrass (Axonopus affinis) and kikuyugrass (Pennisetum clandestinum), and Paul has shared some stunning images of the fairways at this club that was founded in 1889. A very welcome visitor. Nature in the city at Royal Colombo. What a wonderful golf experience. I went for a walk in a park yesterday. 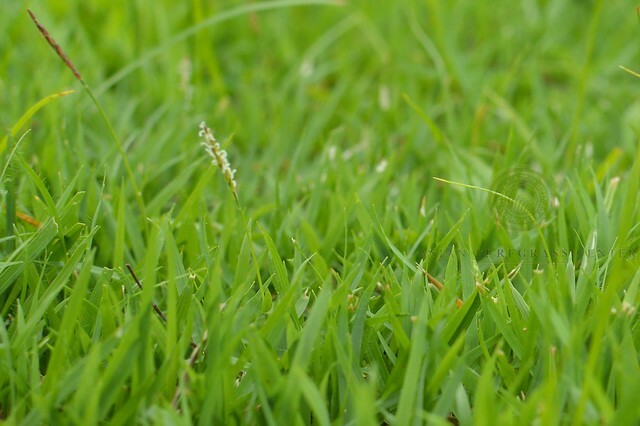 In the first 30 meters, I saw four grasses. 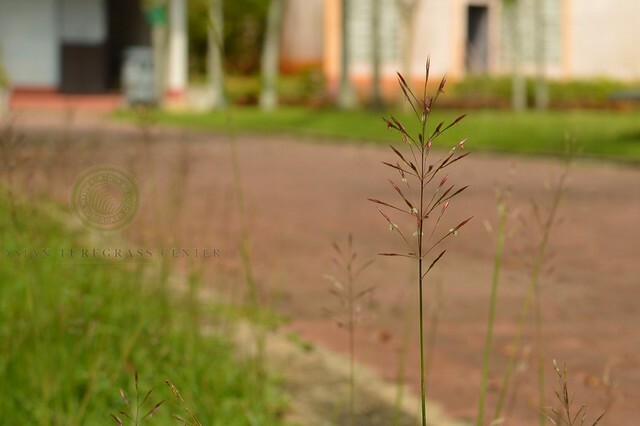 These are common grasses to find in parks in Southeast Asia. 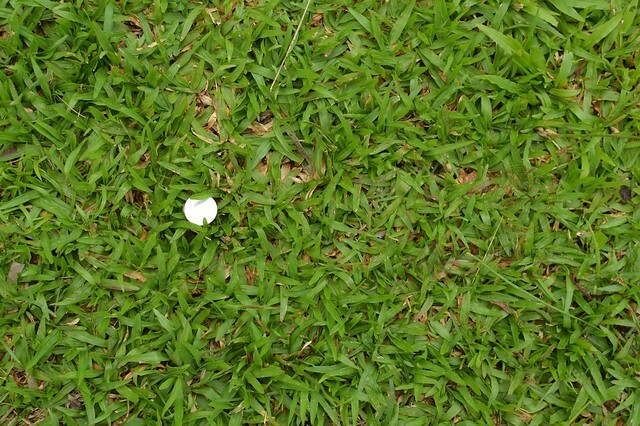 I took a photo of each grass from above, with a 1 yen coin as a size reference, and also a photo of the typical inflorescence of each species. 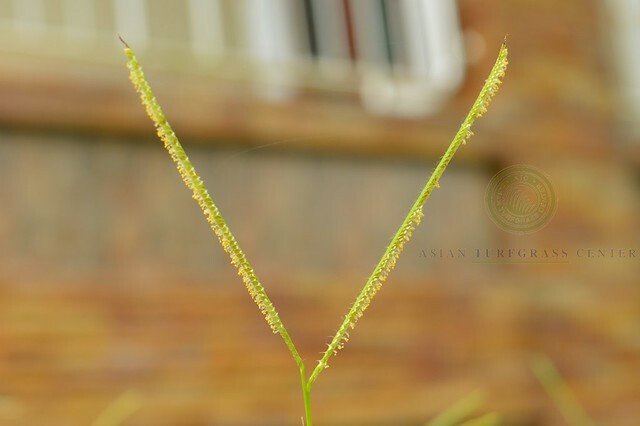 With a little practice, one can identify these grasses with ease by looking at the foliage and inflorescence. This is manilagrass. Well, mostly manilagrass. There is a plant of tropical carpetgrass in there too. The inflorescence with the white flowers is typical for manilagrass. In Southeast Asia, one can usually find the inflorescence in unmown and well-irrigated manilagrass at any time of year. This is tropical carpetgrass. The first place I would look for tropical carpetgrass is under trees. This grass is prolific in shade. Tropical carpetgrass has shiny leaves. This is the typical inflorescence of tropical carpetgrass. Chrysopogon aciculatus has shiny leaves, like tropical carpetgrass, but the leaves are narrower and shorter. This grass is also recognized easily by its distinctive inflorescence. 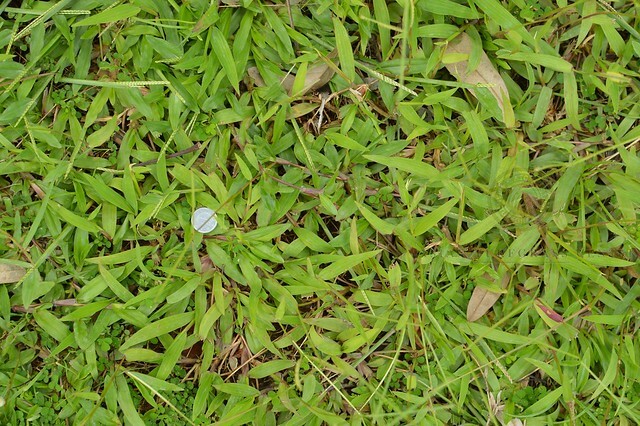 The leaf width of sour paspalum is similar to tropical carpetgrass, but sour paspalum leaves are pale yellow by comparison, and not shiny. 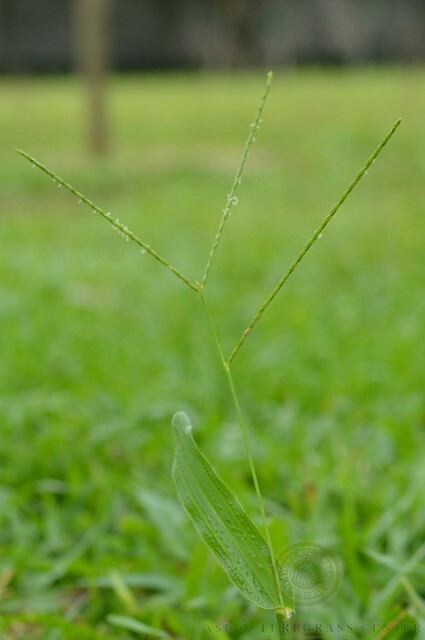 The inflorescence of sour paspalum is also distinct. For the past two years on April 22 I looked at which devices are used to visit this site. Now I have looked up the data for the past year. Mobile continues to increase as a proportion of visits. Tablet and desktop visits continue to decline. I updated my list of turfgrass Shiny apps with the new GP avatar app from PACE Turf. With just a few clicks, you can get a link to download a representation of the turfgrass growth potential at any location. My favorite part of the app? The file names. We wrote the app to make sure the default file names include site information. 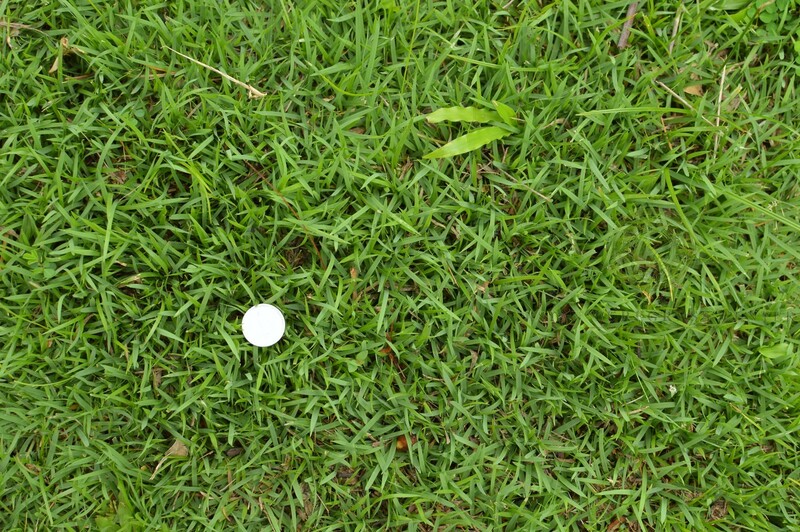 Turfgrass growth is affected by temperature. The temperature-based turfgrass growth potential (GP) is an easy way to look at how the actual temperature is related to the optimum temperatures for growth. PACE Turf put together this GP avatar Shiny app to generate a simple plot of cool-season and warm-season grass GP. There are two options with this app. One can automatically generate avatars for thousands of locations in the USA based on ZIP codes, or one can enter the temperatures for any location. Not everyone understands how the MLSN guidelines work. I saw a recent conversation started by Andrew McDaniel followed by a number of posts from STSAsia exhibiting confusion on the latter's part about the use of the MLSN guidelines. To paraphrase Brian Ripley, "Once you appreciate that you have seriously misread the guidelines, things will become a lot clearer." I'll take the opportunity here to write a short refresher about MLSN. The grass is growing in soil. That soil has a certain amount of nutrients in it. We determine that quantity of nutrients by doing a soil nutrient analysis (a soil test). The amount of nutrients in the soil will change tomorrow, and the next day, and into the future, based on how much we apply as fertilizer, and based on how much the grass uses. But we can use this number. I'm going to call this soil number C. That's the quantity of a nutrient measured by the soil test. On its own, that soil test number isn't useful for anything. I need to compare it to something. How about comparing the amount of a nutrient in the soil to the amount of a nutrient the grass will use? Now I am introducing a time component, because the grass use during 1 month of dormancy is different than the amount of grass use during 1 month of active growth. And the amount of use for 1 day is different than the amount of nutrient use in 1 year. And as STSAsia pointed out, the use is different in different locations. And the use is different for different grasses. Use of the MLSN guidelines explicitly accounts for the expected use of nutrients at any location. Let's call the expected use by the grass A. Now we have two quantities. We have A, which is the amount the grass will use. And we have C, which is the amount in the soil. It would seem that this is enough information to determine a fertilizer requirement. We could say if A is more than C, then we definitely need to add the difference, because otherwise the grass will use more than the soil has. And we could say that if A is smaller than C, we don't need to add that element, because the amount the grass will use is less than the amount in the soil. And that is sort of how it works, but the MLSN guideline adds a buffer of extra nutrients that the grass will never touch. The MLSN guidelines are added to the amount the grass will use. We can call the MLSN guideline amount B. The amount B is a quantity of nutrients that we always want to remain in the soil, untouched by the grass. So we take A, the amount the grass will use, and add to it B, the amount we want to keep as a reserve in the soil. We then compare A + B to C, and that difference becomes the fertilizer requirement. In that way, the site specific and grass specific and climate specific characteristics of each location are considered, and then an appropriate fertilizer recommendation is made. This fertilizer recommendation for each nutrient is based on how much the grass will use at each site, it accounts for keeping a reserve of nutrients in the soil (the MLSN guideline), and for how much of an element is actually in the soil at the time of sampling. paceturf made the calculations for nutrient requirements at Fukuoka and Kuala Lumpur. Although the MLSN guideline is the same at each location, the nutrient recommendations will be more than 4 times higher for Kuala Lumpur than Fukuaka. The MLSN guideline values are the only thing that stays the same. These represent a buffer amount of nutrients in the soil that we don't want the grass to use. Then the site specific values for estimated grass use of each element, and for the actual soil test at that site, make the MLSN approach suitable for just about every environment. "Even though most are not labeled as K fertilizer, it's there"
"What is your approach to K fertility with regards to phosphite products? Even though most are not labeled as K fertilizer, it's there." "I would count the K in that type of phosphite product as a K fertilizer addition. I would ignore the P from phosphite, not counting it as a P fertilizer addition." For more about phosphite, I recommend Penn State's Understanding the phosphonate products. 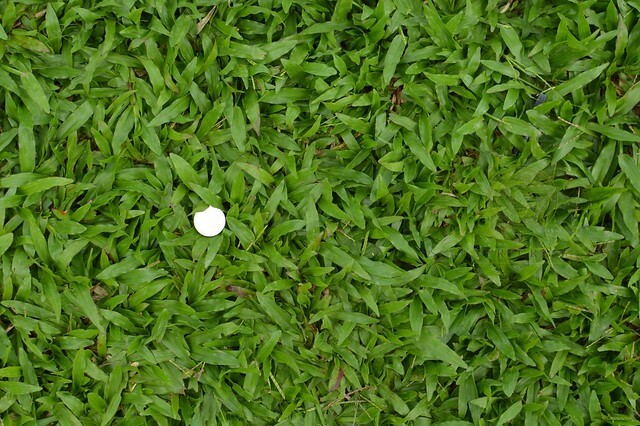 In more than 3000 soil samples from turfgrass sites, how is aluminum affected by pH? Salinity and grow-in of five grass varieties. Is golf in favour again in China? The walking greenkeeper introduced himself on a new blog. Paul Jansen visited Korea. Is this the world's largest/busiest driving range? Presentation slides and additional information about irrigation water quality from my seminar at the Sustainable Turfgrass Management in Asia conference. Photo galleries from the Sustainable Turfgrass Management in Asia conference. Presentation slides and handout from my presentation about irrigation water requirement. Simulating the irrigation frequency using a daily soil water balance. How does the irrigation water requirement change when the irrigation rules are adjusted? Estimating the irrigation water requirement for different soil conditions. Calculating the daily soil water balance while explicity accounting for rootzone depth. This Shiny app simulates the daily soil water balance for real weather data matched to user-specified rootzone characteristics and irrigation rules. Light and temperature combined to look at turfgrass suitability for different climates. Are you subscribed to the ATC updates mailing list? Or the MLSN newsletter list? For more about turfgrass management, browse articles available for download on the ATC Turfgrass Information page, subscribe to this blog by e-mail or with an RSS reader - I use Feedly, or follow asianturfgrass on Twitter. Link and article roundups from previous months are here.